Citation Information: JCI Insight. 2019;4(7):e125019. https://doi.org/10.1172/jci.insight.125019. Senescent cells (SnCs) are increasingly recognized as central effector cells in age-related pathologies. Extracellular vesicles (EVs) are potential cellular communication tools through which SnCs exert central effector functions in the local tissue environment. To test this hypothesis in a medical indication that could be validated clinically, we evaluated EV production from SnCs enriched from chondrocytes isolated from human arthritic cartilage. EV production increased in a dose-responsive manner as the concentration of SnCs increased. The EVs were capable of transferring senescence to nonsenescent chondrocytes and inhibited cartilage formation by non-SnCs. microRNA (miR) profiles of EVs isolated from human arthritic synovial fluid did not fully overlap with the senescent chondrocyte EV profiles. The effect of SnC clearance was tested in a murine model of posttraumatic osteoarthritis. miR and protein profiles changed after senolytic treatment but varied depending on age. In young animals, senolytic treatment altered expression of miR-34a, -30c, -125a, -24, -92a, -150, and -186, and this expression correlated with cartilage production. The primary changes in EV contents in aged mice after senolytic treatment, which only reduced pain and degeneration, were immune related. In sum, EV contents found in synovial fluid may serve as a diagnostic for arthritic disease and indicator for therapeutic efficacy of senolytic treatment. 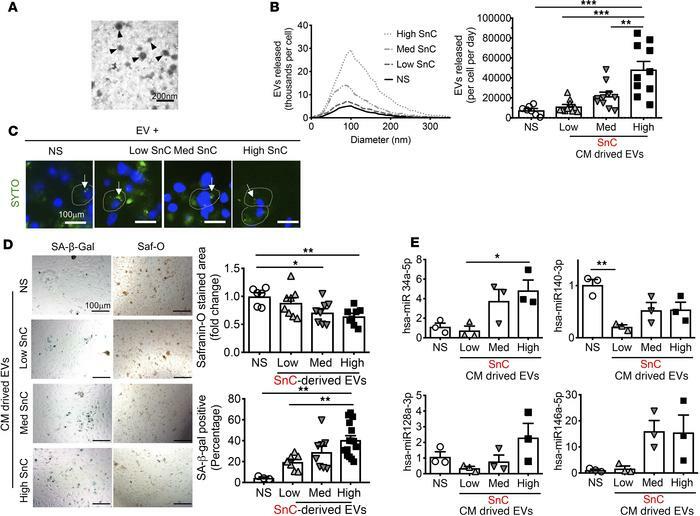 SnC-derived EVs inhibit cartilage ECM deposition of nonsenescent chondrocytes by transmitting cellular senescence. (A) Representative electron micrographs of nonsenescent chondrocyte-derived EVs. Scale bar: 200 nm. (B) Size distribution and concentration of EVs from nonsenescent primary chondrocytes (NS) and low, medium, or high levels of senescent OA chondrocytes, sorted by flow cytometry, determined by nanoparticle tracking analysis. (C) Uptake by nonsenescent chondrocytes of EVs labeled with SYTO RNASelect (arrows; dye-stained EVs). Scale bar: 100 μm. (D) Representative images of SA-β-Gal and Safranin-O staining of nonsenescent chondrocytes 6 days after incubation with EVs (8 × 108) derived from conditioned medium (CM) from high, medium, or low SnC populations to measure the induction of senescence and proteoglycan levels (left). Scale bar: 100 μm. Quantification of the percentage of SA-β-Gal–positive cells (n = 3 for NS; n = 8 for low and medium; n = 15 for high) and Safranin-O–stained areas (n = 6 for NS; n = 8 for low, medium, and high) (right). (E) The expression of selected miRs (hsa-miR-140-3p, -34a-5p, -128a-3p, and -146a-5p) in EVs collected from CM of senescent and nonsenescent chondrocytes, detected by RT-qPCR (n = 3 per group). All data are expressed as mean ± SEM. Statistics in B, D, and E were performed using 1-way ANOVA and Tukey’s multiple-comparisons test. *P < 0.05, **P < 0.01, ***P < 0.001.